The Jeep is getting old. I've got a small rusted out spot and a crack in the windshield. Next month, I need to sink a bit of cash into it as the check engine light comes on and goes off quite a bit. Plus I need an oil change. The driver's seat needs a new application of duct tape over the cracks and we all know I need a new soft top. After 5 years, it's cracked and ripped. 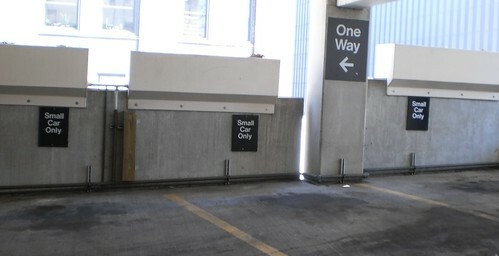 But, you know what, I pull into a parking garage and see a myriad of these spots and I can park there. I'm even smaller than some cars labeled "small" cars. In Chicago, this is a big deal.